The recently released weekly report of the Central Water Commission (CWC) has revealed disturbing figures of the live storage in 91 reservoirs across the country. There is only 32.39 BCM of live storage in all reservoirs together, which is 21 per cent of the total live storage capacity (157.78 BCM). This month last year, reservoirs had 46.88 BCM live storage. There are only 18 reservoirs with storage more than last year. 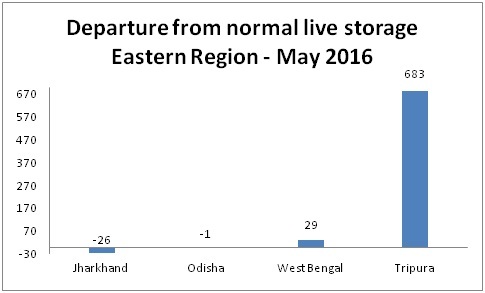 Thirteen reservoirs have less than 20 per cent storage with respect to last year. 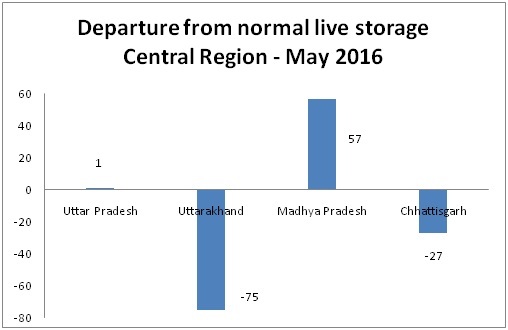 Also, 36 reservoirs have storage less than or equal to 50 per cent of last year. The departure from normal storage in different regions of the country shows that only Tripura, Madhya Pradesh, West Bengal and Uttar Pradesh have positive inclination toward storing water. 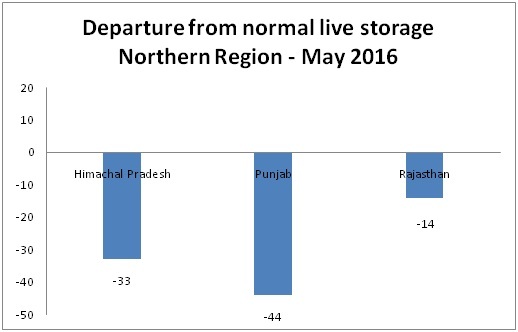 The available live storage has decreased significantly in all regions of the country since May 2015 (Table 1). "Live storage" means the portion of reservoir water that can be used for controlling floods, power production, navigation and downstream releases. In some places, it also serves as a source of drinking water. The quantity of water to be considered as live storage is mainly governed by rainfall. Poor rainfall has reduced the water level in major reservoirs and the crisis has deepened in states such as Rajasthan, Jharkhand, Odisha, West Bengal, Andhra Pradesh, Madhya Pradesh, Uttar Pradesh, Gujarat, Andhra Pradesh and Telangana. 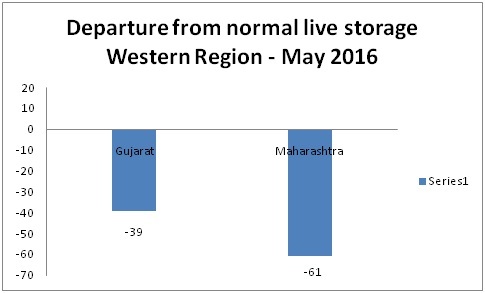 The analysis of current live storage data clearly shows that storage in May 2016 is 64 per cent of the storage for the same period last year and 77 per cent of the storage of the last 10 years. Region-wise observation marks the drop in live storage, which is far below the normal level (See 'Region-wise storage pattern'). 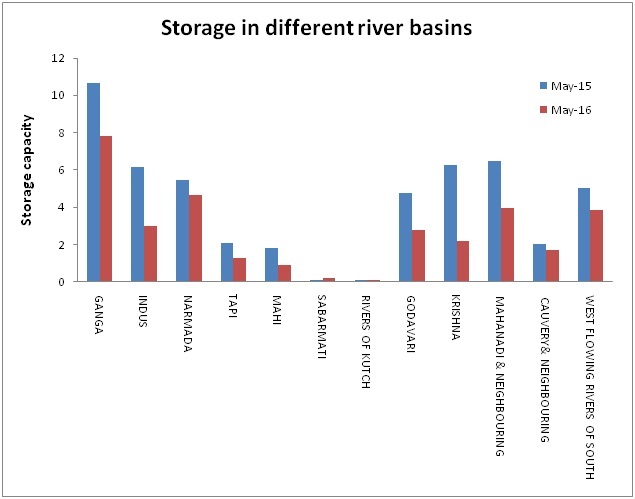 Basin-wise storage condition suggests that the Ganga, Sabarmati and Narmada have better storage than normal and rivers Indus, Tapi, Mahi, Godavari and Cauvery are deficient. The Krishna is highly deficient. Rivers of Kutch, Mahanadi and west-flowing rivers of the South are close to normal in water storage. However, when compared to last year's water storage capacity in the river basin, one sees a sudden fall in almost all river basins in the country (See 'Basin-wise storage pattern'). The India Meteorological Department (IMD) has forecast an above normal monsoon, at 106 per cent of the Long Period Average (LPA). LPA is average seasonal rainfall over the country in the past 50 years, starting 1951, and it is estimated to be 89 cm. The back-to-back water crisis in 2015 and 2016 has led to a parched groundwater table and drained reservoirs. All eyes are on the monsoon which can salvage the live storage situation of reservoirs.